January 2, 2015 By Elizabeth Lindemann 25 Comments / This post may contain affiliate links. Happy new year, everyone! It’s 2015!! YAY!! I love the fresh start feel to a new year. 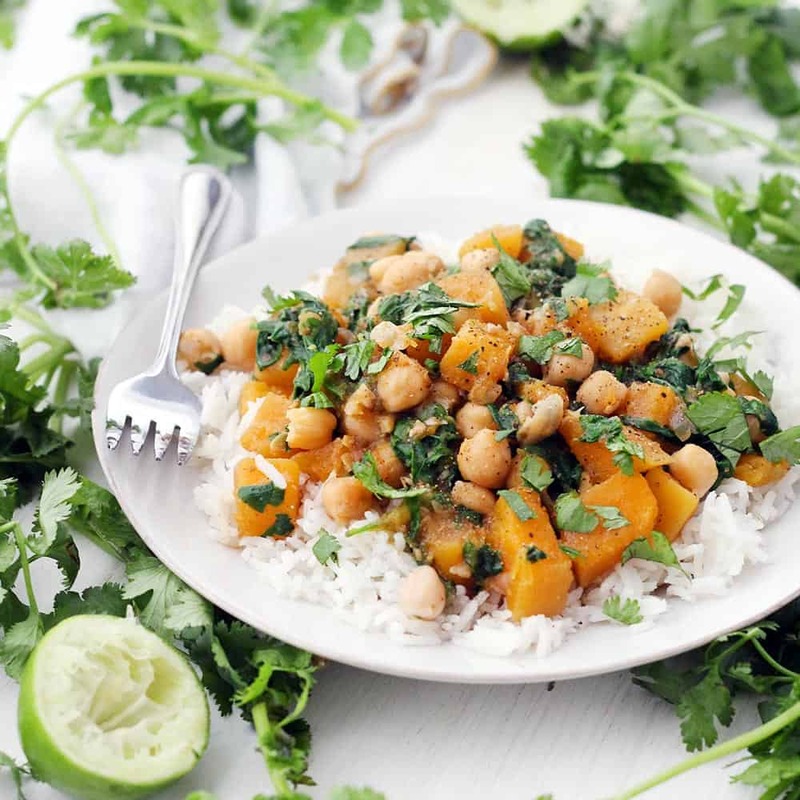 This Moroccan Butternut Squash, Chickpea, and Spinach Stew is a super healthy and super yummy meal to start your year off right. This vegan, gluten-free stew is packed with healthy, nutrient-packed ingredients. It’s warm, both in temperature and from flavorful spice combination of allspice, cinnamon, ginger, cumin, and cayenne pepper. I could eat this all day every day. Who says you need to only have salads to eat healthy (and who wants to eat them when it’s cold outside?)? I keep seeing so many salads out there for healthy recipes for the new year. I love me a good salad… but I don’t exactly crave them in January. Warm, comforting dishes are much higher on my priority list. On my last post, I talked about how only 8 percent of people keep their new years resolutions- I think, partially because they often revolve around depriving oneself of delicious things. I think that if you make goals to eat more of what’s good for you, rather than less of what’s bad for you, it’s much easier. Why more plants, you ask? Isn’t that just being vegan? Well, yes. But I love meat. And I love cheese. And I do not intend to give them up. However, I also know how many nutrients are packed into plant-based meals, and that meat and cheese that’s organic and from happy animals is expensive and sometimes hard to come by. And what better way to eat more plants than to cook more vegan meals? I consider myself a “conscientious omnivore.” It would be very hard for me to be completely vegan, or even vegetarian. In 2014, I ate meat about 2-3 times per week. That doesn’t mean when I went to the grocery store that my cart wasn’t filled with um like five blocks of cheese. In 2015, I would like to cut back on the other animal products by eating more vegetables, legumes, and whole grains. One step at a time. 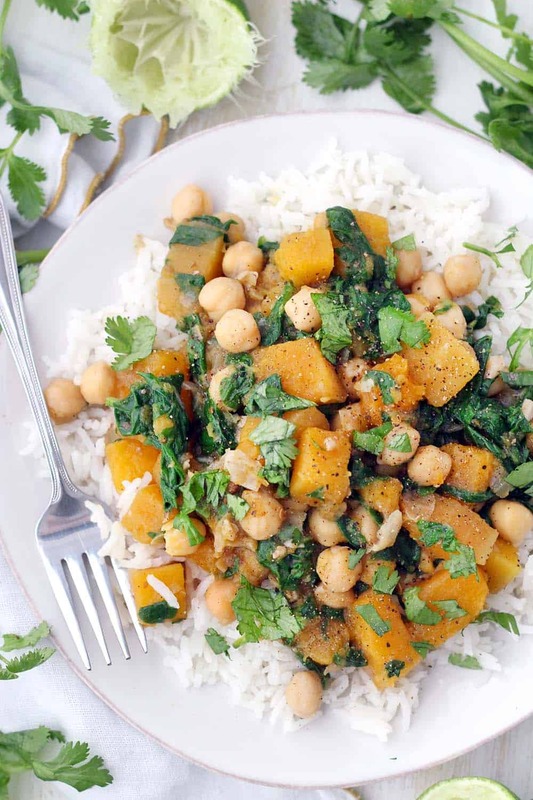 First step: this Moroccan Butternut Squash Stew. I served this stew over white basmati rice, but it would be delicious over brown rice, couscous, quinoa, or cilantro lime brown rice. Or, for a grain free option, cauliflower rice or even just by itself. Want more protein in this meatless dish? Try poaching or frying an egg and serving it on top. This recipe will take you 30 minutes max to make, and you can cook a large batch and freeze it for later. 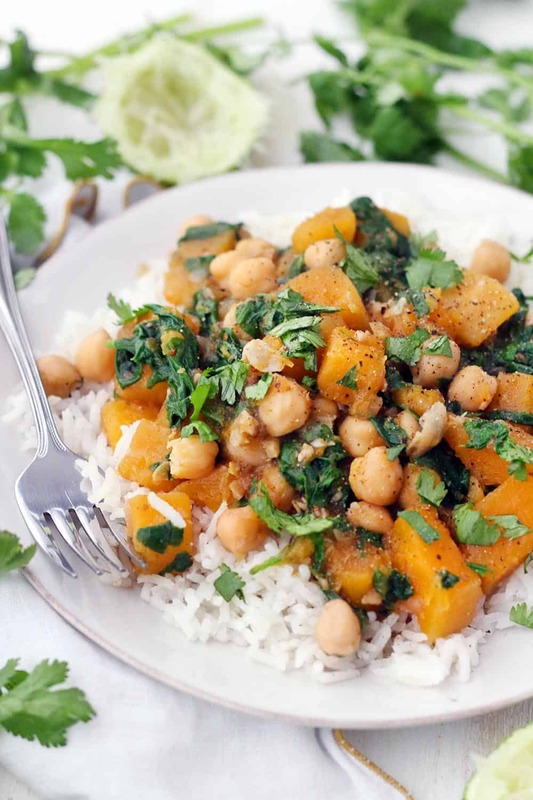 Here’s the printable recipe for Moroccan Butternut Squash, Chickpea, and Spinach Stew! 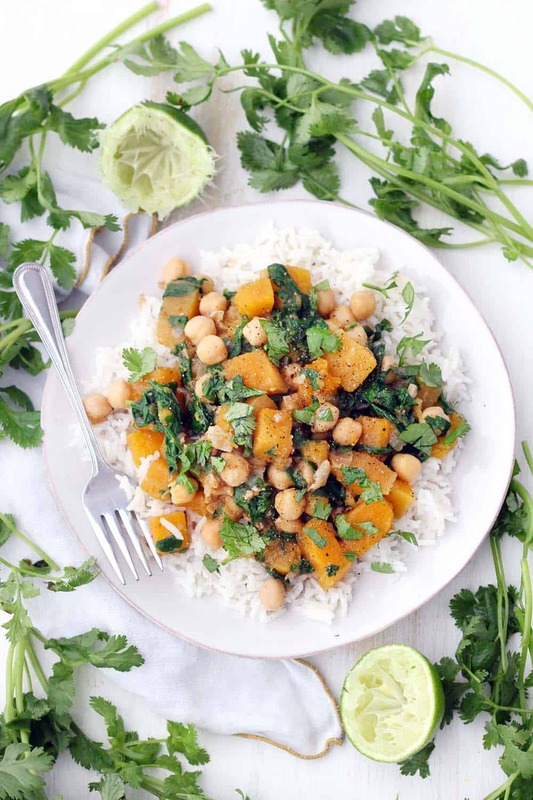 This spicy, healthy, vegan stew is packed full of butternut squash, chickpeas, spinach, and warm moroccan flavors. It's healthy, hearty, and gluten-free. Make in bulk and freeze the extra! In a large pot, saute onion and ginger in oil over medium-high heat until softened. Add chickpeas and spinach, turn heat to medium, and cover. The spinach will wilt and the chickpeas will heat through. Stir stew, adding the lime juice and cilantro. The squash will naturally integrate into the sauce to thicken slightly. Serve over rice, quinoa, cauliflower rice, or cous cous if desired. Not a fan of spicy recipes? Leave the cayenne pepper out. I did this when I made it for my 11 month old daughter and she couldn't eat it fast enough! Really good! Followed the recipe to the letter except I added a little extra water. I had it with quinoa for some extra protein and the flavours went together really well. Thanks! So glad you liked it! Love the idea of serving it with quinoa. Thanks for the comment! Ooo I love this idea to make it a little thicker! Thanks so much for the tip! I made this for dinner tonight and I loved it! What great flavors! I like things a little “creamy” so I added a few tablespoons of full-fat Greek yogurt and it was perfect! Also added a few toasted pine nuts on top for some crunch. This is a keeper and I can’t wait to eat the leftovers for lunch tomorrow. So glad you liked it! Good idea about the yogurt- I bet coconut milk would be great too, even as a substitution for some of all of the broth. Thanks for the comment! my own reference— I used water instead of stock, a mix of kabocha and butternut squash, lots of harissa paste, and also put in about a half can of fire roasted tomatoes. Served over brown rice. Oooo I LOVE the idea of using harissa paste! Thanks for the suggestion, and glad you liked it! Very nice recipe but please try to be greener by not using an enormous font in the printable version and therefore wasting a whole sheet of paper every time someone prints it. Oh, that’s a great idea! I wish I were better at coding- I’m sure it’s a simple fix for people that know things about it, but unfortunately, I’m stuck with the settings on my theme right now. There isn’t an option for me to just change the font on my recipe card. I’ll keep it in mind for the future! In the meantime, this is an easy fix on your end- on print settings, find the option to scale it, and set it at 75% rather than 100%. That should fit it on one piece of paper. Glad you liked the recipe, and thanks for the suggestion! Loved this recipe! It was pure coincidence that I had the ingredients, but it was so quick and easy to make as so different from what I usually make. 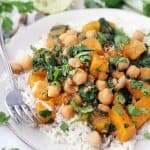 l shared this recipe with all my friends! I will definitely will make it again. Yummmmmm!!!! Never normally comment on recipes but this was so good !! I added a dollop of harissa paste and some homegrown basil. Couldn’t stop eating it and had to get some bread to mop up the sauce when I’d finished because it was soooooo good. So much flavour. Thank you so much! I’m so glad you took the time to leave this comment! And also glad you liked the recipe so much :) I love the idea of adding harissa and basil. Looks so good! I will be trying this! Rather than an egg to bump up the protein, what else could I use? Another bean, or chicken? I’m looking for meals I can cook and freeze for my 81 year old mom to easily reheat. Excellent recipe: so easy, so fast, so delicious! Since ras el hanout has elements of most of the spices listed in the recipe, that can be substituted and supplemented with za’atar. To continue with the Mediterranean profile, harissa paste can be substituted for cayenne and salt. For a protein boost I served the curry with quinoa prepared with sodium-free veggie broth and berbere. This recipe is now a family fave – with or without the substitutions. This stew tastes amazing! I love the spice combination and it was delicious with brown rice. I substituted kale for the spinach and it worked really well. Awesome recipe, Elizabeth. This looks amazing! I have butternut squash sitting on the counter right now. Thanks for sharing! To add more protein and keep it vegetarian, serve the stew over cooked Farro! Its delicious cooked with vegetable stock or broth adds flavor and is very filling. Yum! Awesome idea. I love Farro. Glad you liked the recipe! Wow, teachers are people too! 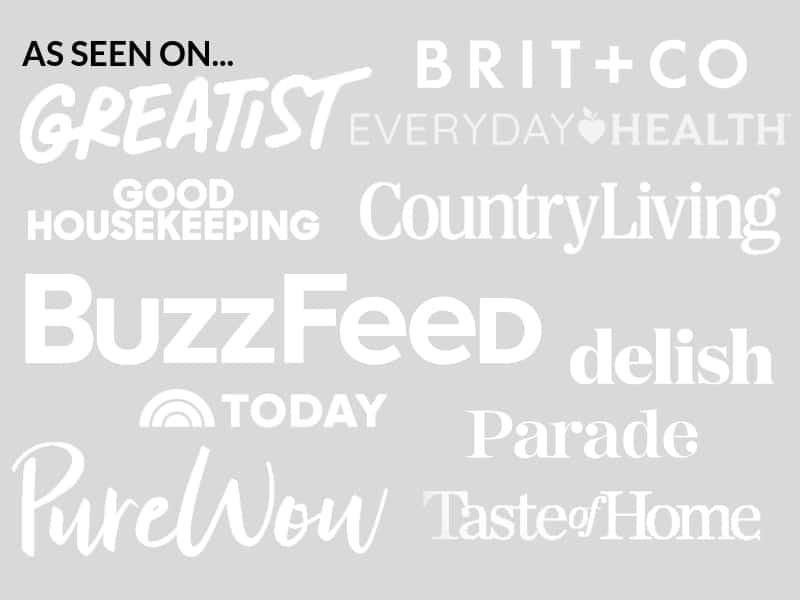 Lovely blog with a good name. Happy New Year and God Bless! Hah! Yes – despite popular belief, teachers are actually people with other interests :-) Thank you so much for your kind words. Happy new year to you as well!